Nice view from the terrace of Chez Francis, probably one of the best of the Eiffel tower. Classic Parisian Brasserie with a very welcoming décor (updated in 2018). Refined French classic cuisine into a warm and spacious place. Gilles & Boissier home-designer Art-Deco decoration, unforgettable view of the Eiffel Tower. Terrace can be available in summer time. Opened daily. Flottes is an Art Nouveau brasserie owned by the same family from the beginning. Traditional brasserie food and specialities from Auvergne, Centre of France. Warm and professional staff. Highly recommended. This true bastion of parisian dinning located at Place des Ternes is as flamboyant as it was in the 1930's, has managed to remain youthfull, vibrant and warm. Its refined Art Nouveau Deco boast century. Old mosaics and chandeliers of St Louis crystal. La Lorraine is also synonymous with one the most impressive seafood tables in Paris. For the first time ever, a brasserie is offering 110 wines by the glass as part of a unique sommelier-inspired menu in which each dish is associated with 4 wines. Art Deco spot accross from the bourse ( stock exchange ). Lively brasserie, perfect for an after show dinner. French brasserie specialities. This bar, brasserie and restaurant is a Montparnasse mythical place, where the importance of celebration and art of living are joyously proclaimed. you will delight in the impeccable traditional cuisine. This historical landmark is worth a visit. 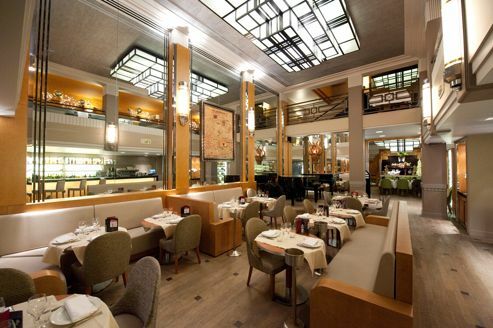 Large, animated and very Parisian brasserie located a step away from the Champs-Elysées. This restaurant offers a good brasserie cuisine in a beautiful 1930’s setting with a piano bar. Near Place Victor Hugo, you will find Stella. it has been renovated without losing its superb tone of excellence. A contemporary brasserie recently bought by the Costes Brothers. Nice terrace on the Trocadero, a stone throw away from the Eiffel tower. Revisited brasserie dishes, trendy ambiance and loung music. Walking distance from the hotel and non stop service from 7.30 AM to midnight. With its gorgeous Art Deco rooms, this long-running seafooder in the 16th is still a treasure for its classic and irreproachable plates of sea food, smoker salmon and French caviar. Casual Café with traditional French Cuisine. Decoration "1900". Moderate prices. Magnificent brasserie where waiters “à l’ancienne” carry superb platers of sea products and Alsacian specialties. Ideal for dinner after a show at the Opera Bastille.